The Japanese Pokemon site has now officially launched a Super Pokemon Scramble website, and with it released tons of new information, a trailer, and a bunch of screens for the game. 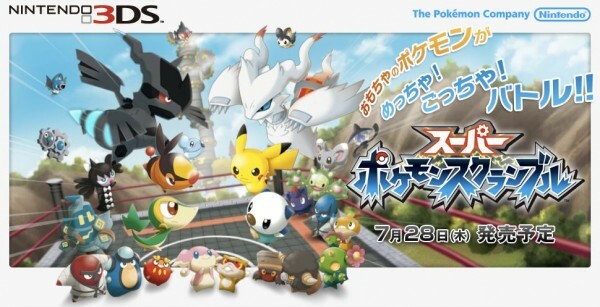 Super Pokemon Scramble is a sequel to the WiiWare game Pokemon Rumble. It is set in the world of toys, where you navigate your wind-up toy Pokemon through various overhead levels that conclude with a boss fight. You can obtain new Pokemon by defeating them in battle. You can also change your current Pokemon at any time via the menu. However, the game includes a lot more content since it is a full retail release. For example, it contains all Pokemon species instead of being limited to certain generations. The game also includes many more battle modes aside from the main levels. The Battle Royale mode pits you against every other Pokemon in the room in a free-for-all. The Totsugeki Battle mode pits dozens of Pokemon in battle. Also new to Super Pokemon Scramble is wireless multiplayer. Two players can wirelessly sync up their 3DS systems to play cooperatively on the main stages. Additionally, you can obtain copies of other players’ Miis and Pokemon to fight via SpotPass. Oh, and be sure to check out the trailer and screens below.